Molly has given some prominence recently to the general strike in northern provinces of Spain, mostly because the driving force behind this strike was the anarchosyndicalist Spanish CGT. The CGT, however, alone in this effort, supported as it was by other libertarian and leftist unions especially in Catalonia, by various civil society groups and, most importantly, by a collection of Basque nationalist unions in the Basque countries. The latter was despite the neutral to hostile attitude of the major Basque nationalist party which is acting as a prop for the Zapatero government in Madrid, the very government whose policies the latest general strike opposed. While I think the CGT can be credited with the initiation of the idea of a second general strike it was in the Basque countries where local unions predominate over the treacherous UGT and CCOO that the strike seemed to have received its greatest support. This is in contrast to Galicia and Catalonia where, insofar as I can determine, the results of the strike were quite mixed. I would be surprised if the CGT was under any illusions about exactly how much the strike could achieve. The CGT is a mass organization not a collection of vaguely "anarchistic" black blockers more interested in showing off and making "statements" about their purity than in results. I must admit, however, that I am unclear about exactly what the CGT hoped to achieve, but much more on that later. For now the simple achievement on the part of an anarchosyndicalist union of actually being able to call a general strike that drew large if not massive support is something that the libertarian left elsewhere in the world is far from being able to achieve. To be honest the support in the Basque countries, non-anarchist as it as, was undoubtedly key to the CGT's plans. It leaves at least one area of Spain where the so-called "socialists" of the Zapatero government can't depend on bribing the bureaucrats of the UGT and CCOO in order to decrease opposition. What follows is mainly drawn from the extensive reports on the general strike published at the Spanish anarchist news service La Haine. I caution the reader that what follows is one sided as little about what happens in the Basque countries hits other media even in Spain, and I am unable to give the "other side" ( ie not the one I support ) like I am in the case of Catalonia. This can be important as estimates of support are obviously biased by one's likes and dislikes. I use La Haine mainly because it is a good site in Spanish as opposed to Catalan which I often miss even the general sense in. # The leaders of the Basque unions, ELA, LAB, STEE-EILAS and HIRU EHNE have expressed their satisfaction with the "very broad support" shown for the strike, especially in the industrial sector. #The unions involved actually claimed "majority" support. #The unions claim a "practical shutdown" of the chemical and metal industries. #The cooperative sector achieved a "high degree" of compliance with the strike. #The situation in ports and airports is unknown, but the unions expect that the Port Authority will essentially have been shut down. #In education the compliance with the strike ranged from 50% to up to 90% depending upon the area. #10,000 people marched in Bilbao, the same number claimed by the unions in much larger Barcelona. Speakers denounced the role of the UGT and CCOO in supporting the government's pension plans. #In Iruña people occupied a building to support the general strike. 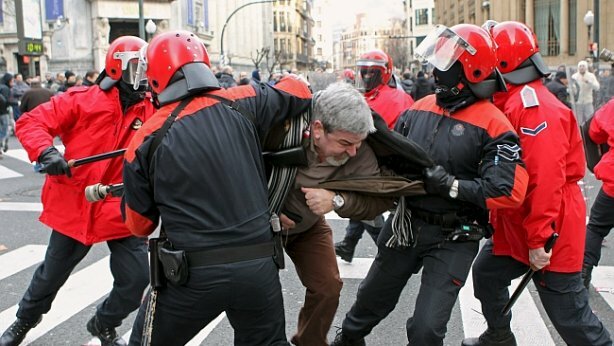 This occupation is similar to what has been occurring in Barcelona in the last few weeks with the dispute about CGT headquarters. Labels: anarcho-syndicalism, Basque countries, CGT, general strike, international labour, labour., Spain, strike.